Hello, everyone. 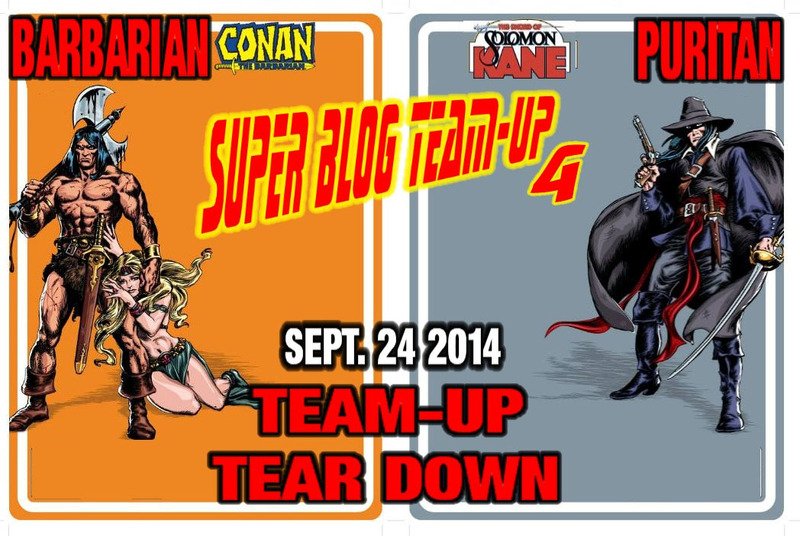 For those who are visiting this blog for the first time as part of Super Blog Team-Up 4, welcome. My name is Ben Herman, and this is In My Not So Humble Opinion. Here’s where I ramble on about comic books, movies, television and science fiction, while occasionally venturing into the dual minefields of religion and politics. Yeah, I just cannot leave well enough alone! The theme of this edition of Super Blog Team-Up is “Team-Up Tear Down.” I decided to take a look at one of my favorite odd-but-cool comic book team-ups. It’s one of those things that when it was published fans were probably wondering “Wow, why didn’t I think of that?” Courtesy of writer Roy Thomas, artist Colin MacNeil and editor Richard Ashford, from the pages of Savage Sword of Conan #219-220, is “Death’s Dark Riders” featuring the time-twisting team-up of Robert E. Howard’s two iconic sword & sorcery heroes, Conan the Barbarian and Solomon Kane. Robert E. Howard (1906 – 1936), born and raised in Texas, was a prolific writer of pulp fiction who specialized in two-fisted action delivered with a helping of philosophical contemplation. He is best known as the creator of Conan, the hot-tempered warrior who lived during the Hyborian Age, a fictional era of pre-history. Although REH only penned twenty Conan stories during his lifetime, in the years after his death the character became wildly popular, with numerous other writers continuing the character’s adventures in prose, comic books, movies, and television. Less well-known than Conan is REH’s grim Puritan avenger, the man known as Solomon Kane. Unlike Conan, Kane occupied a genuine historical period, the mid to late 16th Century. A dour, brooding, black-clad figure, Kane was one of the finest swordsmen in the world, possessing nerves of steel. He was cursed with an insatiable wanderlust, and he crisscrossed the globe encountering numerous foes, both human and otherworldly. The deeply religious Kane reconciled his craving for adventure by regarding himself as “a great vessel of wrath and a sword of deliverance,” an agent of God against the forces of evil. “It hath been my duty in times past to ease various evil men of their lives,” Kane somberly proclaims in REH’s story “Blades of the Brotherhood.” One could certainly characterize Kane as single-minded, even monomaniacal, a figure who would hunt an adversary to the ends of the Earth in the pursuit of justice. “The Moon of Skulls,” published in 1930 in Weird Tales, sees Solomon Kane at the end of a years-long quest to locate Marylin Taferal, a young Englishwoman who was kidnapped and sold into slavery. Kane finally tracks Marylin to Africa, to the ancient, lost city of Negari. Founded countless thousands of years before by colonists from Atlantis, Negari became the last outpost of that civilization after the mythical continent sank into the seas. The people of Negari worshiped dark gods and engaged in human sacrifice. As the millennia passed, though, their numbers dwindled, until a thousand years before Kane’s arrival they were finally slain by their African slaves, aided by the renegade priest Nakura. Kane discovers that the inhabitants of Negari have devolved into brutal savages. They are led by the bloodthirsty Queen Nakari, whose ambition is to lead her subjects in the conquest of the African continent. Practitioners of their former masters’ dark religion, the Negarai plan to sacrifice Marylin to the skull of Nakura, which they worship. Kane must find a way to rescue her and escape from the city’s insane inhabitants. Howard does good work on “The Moon of Skulls.” It is a thrilling adventure with rich descriptions and poetic language. Although not nearly as refined or sophisticated as the writing he would be doing in a few short years, it is still a solid yarn. However it does have certain problems. Howard does rely a bit too much on lengthy exposition. The resolution is also somewhat dependent upon convenient coincidence. More of a problem, though, is the blatant racism on display. The Africans in “The Moon of Skulls” are depicted by Howard as savage, grotesque sub-humans. I am sure that an argument could be made that Howard was a product of his time and upbringing, that institutionalized racism was the norm in early 20th Century America, particularly in the South. Nevertheless this aspect of the story, as well as other works by REH, has undoubtedly aged poorly and now stands out as offensive. It mars what is otherwise an entertaining tale. Having said all that, REH was still a talented writer. If you can get past the unfortunate racism that occasionally appeared in his stories then there is much to admire in his works. 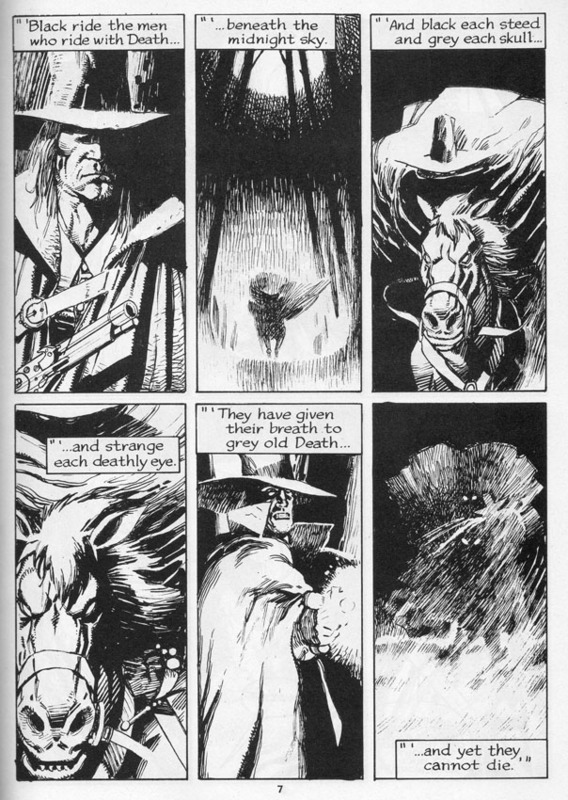 I am certainly a fan of Solomon Kane, who I find to be an intriguing protagonist. Okay, end digression! Getting back to our team-up… how would you bring together Conan and Solomon Kane, who lived approximately twelve millennia apart? Well, if anyone was going to find a way to have the Barbarian and the Puritan in one story, it was going to be Roy Thomas. Back in 1970, Thomas was instrumental in convincing Marvel Comics to publish the Conan the Barbarian series (for a nice rundown on how that took place, I recommend picking up Alter Ego #70, which features a lengthy interview of Thomas by Jim Amash, and Back Issue #11, which contains Tom Stewart’s in-depth look at Marvel’s Conan comics, both of which are available from TwoMorrows Publishing). In the past four decades Thomas has written several hundred comic book stories featuring the character of Conan, as well as various other REH-inspired tales. He is definitely an authority on the works of REH, and I think he’s played a significant role in the character of Conan becoming such a cultural icon. 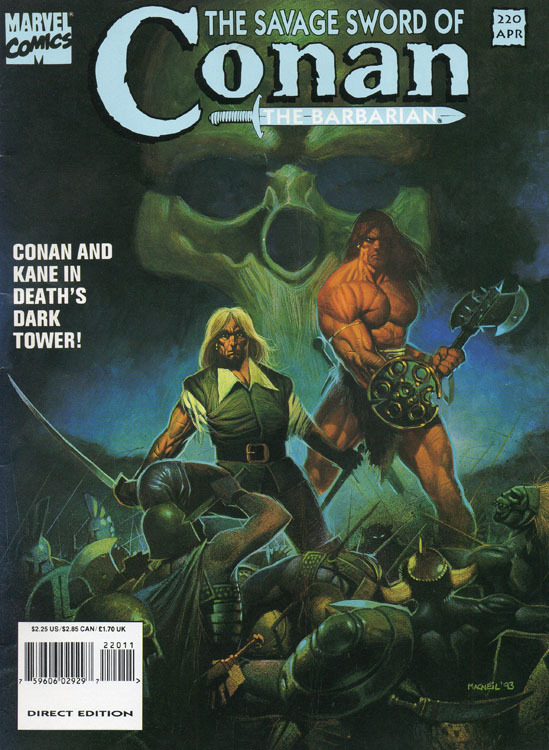 As explained in a text piece in Savage Sword #219, Thomas was inspired to write a sequel to “The Moon of Skulls” for the Conan / Kane team-up by the fact that Conan’s people, the Cimmerians, were descendants of the ancient Atlanteans, the same civilization that had established the city of Negari. The two adventurers are thus brought together via time travel generated by the mystical powers of the sorcerer Nakura’s skull. Elsewhen, twelve thousand years in the past, we see Conan at a point relatively early in his life. He is still mourning the recent death of his first love, the pirate queen Belit (see either the REH story “Queen of the Black Coast” or Conan the Barbarian #100 from Marvel for all the details). Seeking to evade pursuit by a hostile tribe stalking him through the wilderness of Kush (the ancient Africa of the Hyborean Age), Conan stumbles across Negari. He is ambushed and taken captive by the city’s inhabitants. Meanwhile, back in the early 1600s, Kane awakens to find he has been spirited away to the ruins of Negari, where the latest would-be ruler is seeking to restore the fallen empire. Tendrils of energy snake out from the skull of Nakura towards Kane, enveloping him. He finds himself transported to a mysterious black chamber, and face to face with a very angry Cimmerian. Courtesy of a Mighty Marvel Misunderstanding, Conan and Kane quickly lock swords, each of them assuming that the other is an agent of Negari. Despite the Barbarian being in the prime of his life and the Puritan well past middle age, the later gives a good accounting of himself. The two men fight to a standstill, all the while trading not just sword-thrusts but verbal barbs. Gradually the pair comes to realize that they are not enemies. At last Kane extends the hand of friendship, which Conan accepts. 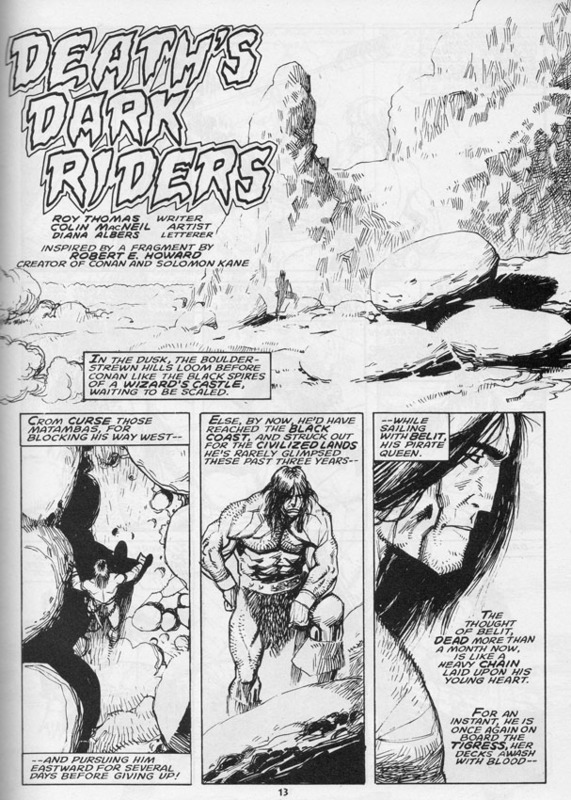 Exiting the dark chamber, in fact an immense hollow skull, Conan and Kane find themselves facing the soldiers of Negari. Fighting them off and fleeing though the city, they gradually come to realize that somehow they have both been transported back in time, to a point even earlier than the Hyborean Age, when Nakura himself was still alive, and plotting to seize power. After witnessing the betrayal of the Atlanteans by Nakura and the rise to power by the former African slaves, Conan and Kane fight their way back through the city to the giant skull statue, hoping it will return them to their correct time periods. The two are catapulted forward to Kane’s time, where the spirit of Nakura now inhabits his preserved skull. Nakura orders his phantom Black Riders and the Negari warriors to slay the pair. The Cimmerian and the Englishman battle side by side against the forces of darkness, finally overcoming Nakura and his servants. 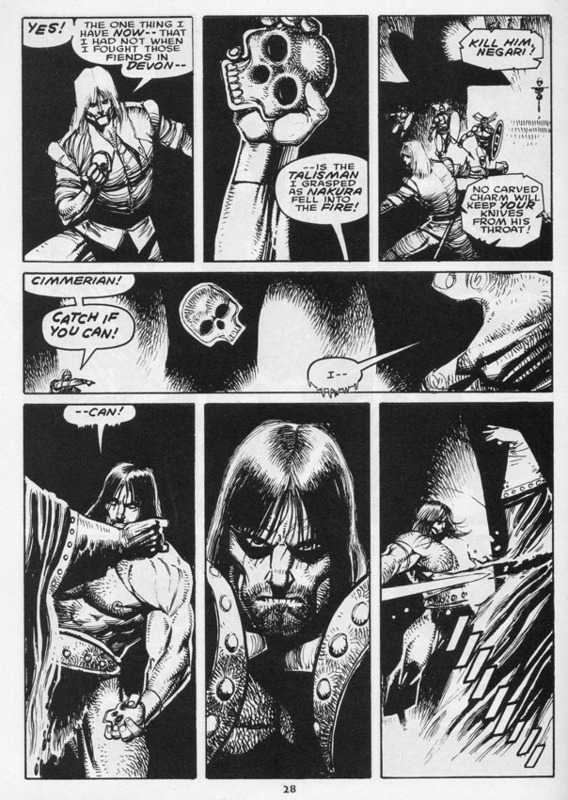 Their enemies defeated, Conan moves to clasp Kane’s hand, only for it to pass through insubstantial. The two realize that the spell that brought them together is fading, and Conan comments that “soon the ages will gape between us again, like a chasm beyond crossing” to which Kane responds “Except by friendship.” And thus they are once again separated by the vast millennia, left to journey on their separate paths. Thomas does excellent work scripting the interactions between Conan and Kane. Even after they realize that they are on the same side, there still a fair amount of verbal sparring. Much of this banter revolves around Kane’s professions of deep faith in God, in contrast to Conan’s avowed self-reliance on his own abilities rather than upon the assistance of the disinterested deities of his era. Even in the midst of hacking away at their adversaries, the Puritan and the Pagan cannot resist taking shots at one another for their particular approaches to the spiritual. There is also the contrast of age, with Conan half-dismissing Kane as an “old man” and Kane regarding Conan as a “callow youth.” Given that both of these men are strong-willed and stubborn it makes sense that Thomas shows a bit of rivalry between the two. “Death’s Dark Riders” is illustrated by British artist Colin MacNeil. It was editor Richard Ashford who assigned MacNeil to the story, an excellent choice on his part. 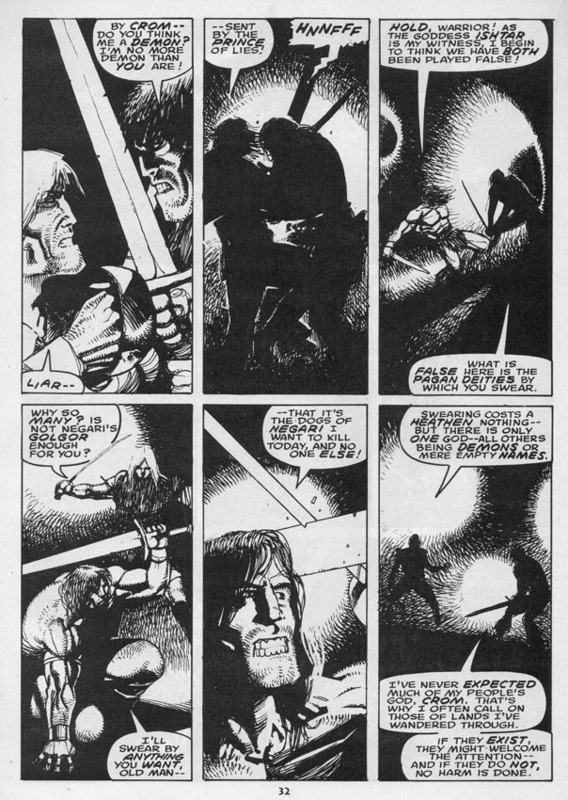 Ashford was obviously someone who appreciated MacNeil’s work, as he also had him draw a number of covers for the bi-weekly anthology series Marvel Comics Presents and for the regular Conan the Barbarian comic. MacNeil is regrettably not too well known here in the States, only having worked on a handful of American books. But he is certainly well-regarded in his native Britain, where he has frequently contributed to 2000 AD, Judge Dredd Megazine and Warhammer Monthly. 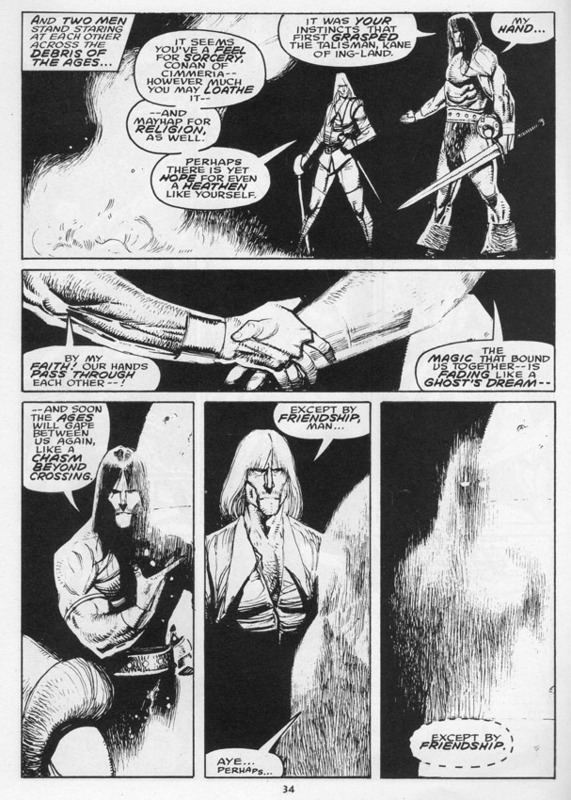 MacNeil’s highly detailed black & white interior work on Savage Sword #s 219-220 is breathtaking and macabre. Likewise, his painted covers for these two issues are striking, atmospheric pieces. MacNeil does excellent work illustrating Conan and Kane, bringing the two men to life. He makes them both strong, powerful individuals, but gives each a separate, distinctive personality and physical presence. “Death’s Dark Riders” is well worth reading, both for Thomas’ excellent writing and MacNeil’s beautiful art. I’m not certain how easy it is to locate copies of these two issues of Savage Sword. Fortunately “Death’s Dark Riders” was reprinted several years ago. In 2009 Dark Horse, the current holder of the comic book licenses for both Conan and Solomon Kane, released the trade paperback The Saga of Solomon Kane. The 400 page volume collects the entirety of black & white stories featuring Kane that was originally published by Marvel between 1973 and 1994. This includes “Death’s Dark Riders,” as well as an adaptation of “The Moon of Skulls” by Don Glut, David Wenzel & Bill Wray that ran in Savage Sword back in 1979. If you are a fan of the character, The Saga of Solomon Kane is recommended. 3. Superior Spider-talk: Spider-man and the Coming of RazorBack!?? 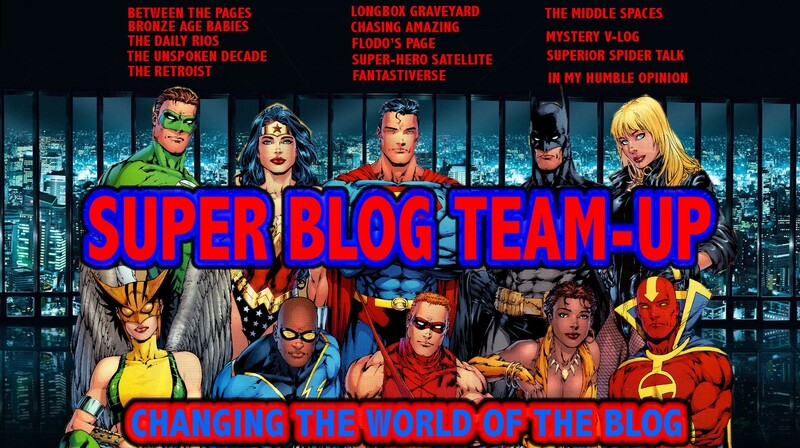 Lets all give a big thank you to Charlton Hero for organizing Super Blog Team-Up 4, as well as for designing all of the awesome promo artwork! Also, thank you to Roy Thomas for taking the time to share his thoughts on the creation of “Death’s Dark Riders” as well as for writing so many fantastic comic books over the decades. Welcome to the group Ben! Excellent Work. I literally didnt know this even happened!! Now I know. Deaths Dark Riders concept is way cool as well! Awesome work! Thanks for the shout out as well! Thank you for the invite to SBTU and for the kind words. I had a fantastic time writing my piece, and I am looking forward to reading everyone else’s contributions. Great post, Ben, I really enjoyed reading it. I read this story the first time rather recently, about a year or so ago in the Saga of Solomon Kane book you mention (for what it’s worth, I also recommend it). Also, I think it’s great that you went right to the source, i.e. Roy Thomas. And I definitely agree with Howell: Thomas truly deserves a lion’s share of the credit for making Conan and Howard’s work in general the super-popular and lucrative properties that they are today. Thank you for stopping by, and for the kind words, Edo. 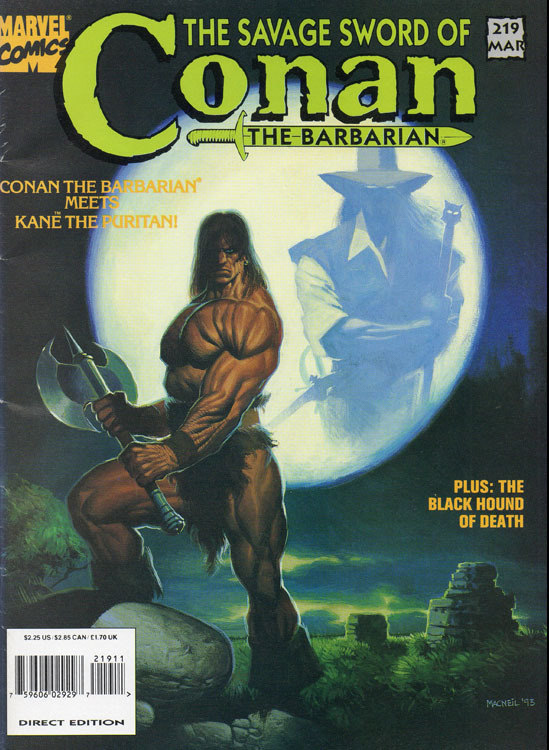 I am a genuine Conan geek — I’ve read all of REH’s tales a time or two, and I think a half-volume of Kane, where I found the character stronger than the stories. I think there’s room for a continuing Kane comic series, with a few tweaks, as a wandering monster hunter in an evil and gothic age. I’d like to read that. I’d like to write that! Sounds like this story worked out better than many of the times Roy would take a scrap of Robert E. Howard (or some non-Conan Howard story) and shape it into a barbarian adventure — I’ll have to hunt it down. And yes, Roy Thomas deserves special recognition as one of Conan’s guardian angels. Only Frank Frazetta played a larger role in rescuing the Cimmerian from obscurity! Hi, Paul. I agree, the character of Solomon Kane is interesting, and there are so many untold periods in his history. It would be great to see some modern fantasy novelists or comic book writers chronicle his adventures. I am not really a Conan guy, although I like the high points. This seems like a high point, and sadly, I missed it. Have to rectify that soon! I was totally unfamiliar with Kane other than knowing his name until this article! This was perfect, man! Great article, and welcome to the Super Blog Team Up!!! !